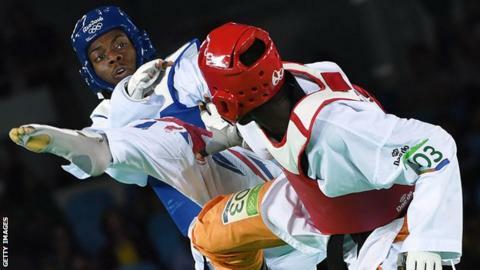 Olympic silver medallist Lutalo Muhammad has pulled out of the World Taekwondo Grand Prix, which begins in London on Friday. The 26-year-old has struggled with knee and hand injuries since losing the -80kg final at the 2016 Rio Olympics. His only fight since last summer was a second-round defeat at the World Championships in South Korea in June. "Although I have turned a corner I am still short of being fighting fit," he wrote on Instagram. Last week, Muhammad told BBC Sport he was "excited" to fight in his home city of London for the first time since winning bronze at the 2012 Olympics. World championship bronze medallist Damon Sansum will be Britain's leading contender in the -80kg division, which will also feature former GB fighter Aaron Cook, who now represents Moldova. Double Olympic champion Jade Jones and two-time world gold medallist Bianca Walkden spearhead the women's team. How do you come back from devastating failure? Read more on How do you come back from devastating failure?